I’ve barely lifted a paintbrush in three weeks and I’m still recovering from my New Year celebrations yet my inbox is overflowing with daily posts of other people’s various ‘January daily painting’ or ‘31 one days, 31 paintings’ challenges! How is it that so many others seem to have hit the New Year running while by comparison, I’m still struggling to get out of bed. It’s enough to make one feel quite anxious. For my part (and largely because it’s already too late for me to make up ground already lost) I’m going to have to make a much slower start to the year! I purposefully took last year off my various home improvement / DIY projects to focus on my painting but for 2017 there are quite a few projects on which I need to make some progress. I can already foresee that balancing these with my painting is likely to prove challenging. I still hope to post regularly and shall be aiming for my usual weekly (ish) posts, but shall be changing my posting day from Tuesdays to Wednesdays to give me a bit more time to pull them together. Most significant for the year ahead by far, however, is that I’ll be exhibiting (for one day only!) in an Artists’ Open House during the Brighton Festival in May. I fully expect that this will sometimes be the carrot and sometimes the stick that motivates me for the first part of the year. So, without dwelling any further on all the things I haven’t achieved yet in 2017, or how little time I’m going to be able to spend painting, I’m going to distract myself with hopeful and optimistic thoughts based on what Santa brought me this year. As I’ve been doing some more sketch based work on figures of late, I was delighted to receive a little collection of A5 and A6 Stillman and Birn Beta sketchbooks for Christmas. I’ve almost filled one of these with figure studies and they’ve been out of stock in the UK for much of last year so it was great to open these on Christmas day and I expect to be featuring more of my sketches on this blog in the months ahead. I do also have a Stillman and Birn Alpha sketchbook that I’ve had for a while but I much prefer the paper weight and surface of the Beta sketchbooks for working in watercolour. 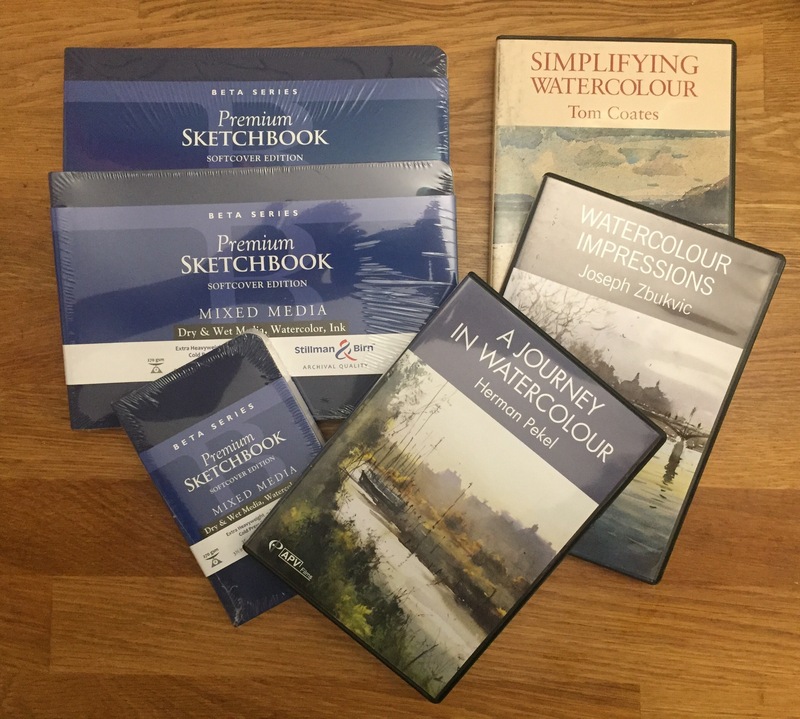 I also received a number of painting DVDs too that I’m really looking forward to watching. (I use the term ‘received’ loosely as I actually bought two of them as gifts to myself!) You can see a list of other DVDs and clips that I’ve already watched and have learnt a great deal from in my library. My only challenge now is to find some time to watch them. Hopefully, I’ll be back in the groove with some paintings to show soon, in the meantime, I wish you all a happy and anxiety free New Year. Have fun with these John! The Zbukvic and Pekel are gems! Tom Coates is a wonderful guy, and really brilliant! love his stories! but you have to see and understand what moves him! he is good! After a long search I finally know where he bought that awesome paper! Hi Edo and Happy New Year! I have a few Zbukvic DVDs already so have an idea what to expect. I’ve seen a bit of Pekel at work but am looking forward to seeing more. Tom Coates is completely unknown to me so I’m looking forward to being surprised – all the more now I’ve read your message! Did you see it by now? at first you think how weird, but it is in real brilliant what he does! have a good sunday and a wonderful Happy New Year !! Hi Edo and Happy New Year to you too! So far I’ve seen about half of the Herman Pekel DVD. Really like his approach, which I think is very painterly and quite carefree. Definitely feel like I’m picking up some good pointers from him. Not sure when I’ll get round to seeing the Tom Coates one! Feels more important that I dedicate some time to actual painting at rather than watching others do it! Looks like some fun loot for a talented artist such as yourself! Congrats on the festival exhibit opportunity. That will be great! Happy New Year! Hi Camie and a happy New Year to you! Thanks so much for your kind comments – all very much appreciated!